Laurie and Janette invite you to join them in a peaceful, Hokitika accommodation on the South Island of New Zealand. Woodland Glen Lodge is a large and beautiful country house, built in 1987 and only 2km from the centre of Hokitika, offering bed and breakfast accommodation. Hokitika wedding venue Our West Coast lodge is popular as a Hokitika wedding venue, as the lodge gardens and rugged West Coast provide a memorable location and superb photographic backdrop. Fishing and hunting Our quality b&b lodge is also a popular New Zealand fishing and hunting lodge, due to its proximity to prime hunting and fishing grounds. However, there are many activities to enjoy in the local area for non-fishing and hunting parties too, as Hokitika was home to the Gold Rush of the early 19th century. Many interesting and historic places can be explored not far from Woodland Glen Lodge. Location You can enjoy our lodge's beautiful location, which is just a few hours drive from other South Island towns — 3 hours drive from Christchurch, 3 hours 45 minutes from Nelson, 2 hours from Westport and 1 hour 50 minutes from Franz Josef township. 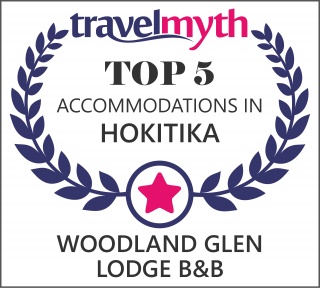 "Hokitika accommodation, Woodland Glen is a quality bed and breakfast on the West Coast of New Zealand's South Island."